British Tars, 1740-1790: What the Hell do we call these? An interesting discussion, and one certainly worth having, was brought up on the Facebook group 18th Century Reenactors by Ike Cech. Not without reason, the gentleman questioned my use of the term "slops" to refer to the wide legged short over-trousers worn by sailors in a substantial number of the images examined in this blog. "Slops" or "Slop-Cloaths" are terms used occasionally throughout the eighteenth century to refer to a sailor's rig. This, in turn, led to the naming of the "slop chest" from which sailors drew cloth and garments. My use of the term was based primarily on eighteenth century dictionaries. One specifically defines slops as "a wide Sort of Breeches worn by Seamen." In the footnotes to a collection of Shakespeare, another defined slops as "large loose breeches, or trowsers, worn only by sailors at present." In Benjamin Martin's 1749 Lingua Britannica Reformata: Or, A New English Dictionary, slops are equated to "Galligaskins" or "a wide sort of breeches," with slops themselves defined simply as "seamans breeches." In all of these, identifying the garment as one worn specifically by sailors is key to the definition. "Slops" were a key garment to the identification of the profession and class of seamen. Dictionaries may have defined the English language in the literal sense, but they did not completely dictate its use. Common usage is difficult to determine, as common speech was not always recorded. Even so, we have access to far more sources than standard dictionaries. One of the best textual sources for the historian of the eighteenth century, especially for the study of the lowest classes, is newspaper. 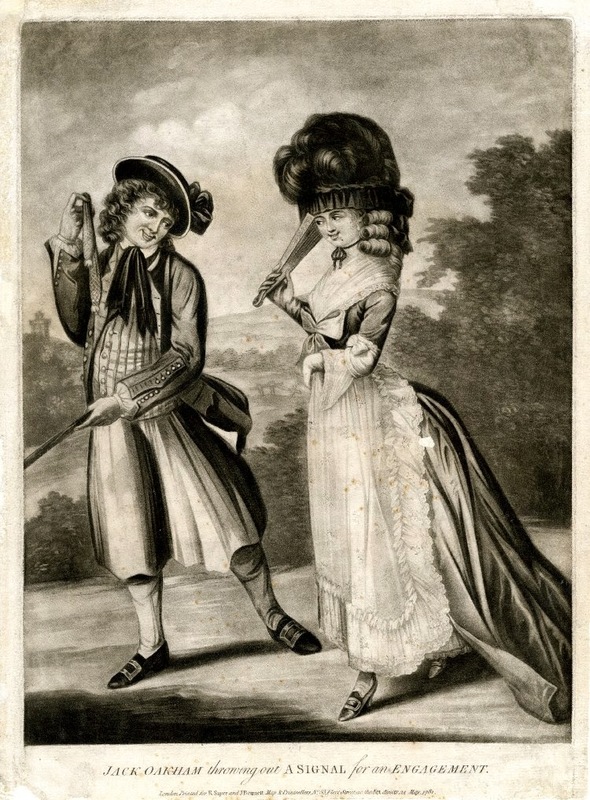 Many surviving eighteenth century newspapers include advertisements, and many of those advertisements include run-aways. Investors and captains of ships were greatly concerned with those who fled their work, and so many advertisements on both sides of the Atlantic offered rewards to anyone who could retrieve runaway sailors. Thankfully for us, those ads included descriptions of their clothing! The garments were described down to the color and fabric, giving us valuable insight. What is notably present from any that I have found thus far is the term "slops." As Ike points out, the term "trousers" (or its many alternate spellings) probably included the garment I refer to as "slops." This calls into question how widely the term was used. Was it an archaic term, preserved only in dictionaries? Was it thought of as a quaint nickname, used only by the upper classes to refer to the clothing of the tars that carried their goods? It is impossible to state its precise use, but it quite possibly was not used as widely as I use it in this blog. Instead, we should probably view it in the same way that clothing historians view the term "apple pasty hat" or as decorative arts experts refer to "highboys." Not necessarily a widely used term of the time, but a quick academic shorthand to the "wide legged breeches" without confusion with the longer legged trousers that are even more common in period images.